Languages have several means at their disposal whereby part or a whole utterance can be emphasized and thereby distinguished from a neutral stretch of speech. Relative loudness is one such means: something shouted at an interlocutor when the distance between speakers does not require raising one’s voice signifies emphasis (both emotive and referential). Another means, when it comes to English in particular, is elongation of the syllabic structure of words, i. e., pronouncing the vowels with unusual length. A related instance of elongation is what one observes in the word please, when a schwa is inserted between the first two consonants for emphasis. As in the case of the amphibrachic structure of treméndous, to which appeal was made in an earlier post, prosody can also provide the means for realizing––or cooperating in the realization of––emphatic meaning. The currently ubiquitous answer to an interlocutor’s statement, instead of just agreeing by saying right or yes or certainly, is the emphatic absolútely, with high pitch on the stressed vowel. Aside from the intrinsic meaning of the word, its anapestic prosody (two unstressed syllables followed by a stressed syllable) is what has particularly contributed to this word’s being preferred nowadays as the emphatic riposte-in-agreement par excellence. The fact of the anapest having two unstressed syllables preceding the stress lends extra force by contrast to the stressed syllable, thereby heightening the emphatic meaning. 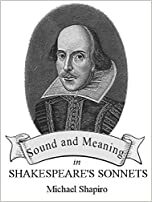 When considering a fitting epigraph for the second edition of our book, The Sense of Form in Literature and Language (2009), I chose the Shakespeare to commemorate my Marianne (עליה השלום). It puts all other poems in the shade in capturing both the haecceity and the quiddity of the romance of our love, where romance is defined as embodying the triumph of spirit over flesh, in life as in death. While sitting this afternoon in a neighborhood restaurant and savoring my caviar and oysters in Marianne’s honor, only the Russian adjective бесподобная (literally, ‘without + similar’ [fem.]) floated into my consciousness, to capture my love and her essence. The European languages have nothing to match this Slavic compositum, with the possible exception of French nonpareille, which is, of course, not strictly synonymous in either structure or meaning. Poets from time immemorial have been trying to capture linguistically the multidimensionality of love. Perhaps the Old Provençal troubadours succeeded, but only in part. No words, no matter how well-turned, can do love justice.